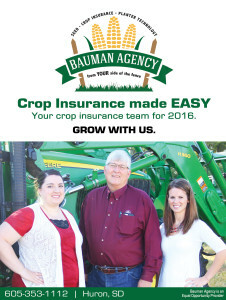 Bauman Agency’s four fully licensed and knowledgeable crop insurance agents provide superior sales and service to our customers. Crop and Crop-Hail coverage are the only lines of insurance we handle, allowing us to focus on the details of crop insurance coverage and how they relate to your farming operation. All four of our agents are involved in their own family farming operations. We recognize the importance of 24 hour access to coverage and see crop insurance from the farmer’s perspective. We assume every crop insurance provider does crop insurance like we do. But, we have learned that they don’t. Your premium dollar buys the same amount of coverage no matter where you buy it. So,why buy from us? We’ve got 3 great reasons! And these 3 pillars are what we have built our business on. We’re available 24/7. We keep office hours year round. We keep extended office hours during the planting season and we have written coverage and answered questions many nights and weekends. There is no guarantee that coverage will be accepted at the last minute but we do our best to get the job done for our customers. We have 4 fully licensed agents. 4 people to write coverage, put in claims, and answer your questions. We have people answering the phone whenever possible. Usually Heather or Amanda will be answering. So, you get right to the crop insurance department when you call. We maintain your file and are happy to keep a copy of your original production evidence. If you let us. So, in the event you need the history, it is a phone call away. We maintain extensive check and balance procedure in our office to prevent errors. Your policy is likely handled by 4 agents whenever changes are made to verify accuracy. We will assist you with your acreage reporting. We don’t just send it home with you to complete. We’ll help you with production reporting maps. We help you utilize your Precision mapping tools, that you have invested in, to help back up your crop insurance reporting. We can provide a map based booklet if that is your preference for acreage and production reporting. We assess the ever-changing crop insurance rules so we can advise you on how they will affect our farms and yours. We hold a private meeting with you to go over your policy each year. We do not blanket cover everyone, we provide personalized quotes. We strive to make your appointment to be useful and worthwhile from a farm management standpoint. Not just security for a lender. We also want it to be a “no fret” experience. Crop insurance can be difficult to fully understand. And that is ok. That is what we are here for. To make crop insurance easy. We write for 3 different companies, and each company has its own set of procedures, perspectives and tools. We try to match the companies to your unique needs. From planting the seed through Harvesting and Marketing your crop, we aim to keep you covered. We see you through every step of the way. We are glad to see you. The coffee is on, pop is in the fridge. We enjoy working with you. We live here. No commuting from outside the area. The four of us are involved in long time family farming operations in Beadle County. Our slogan is “crop insurance from your side of the fence”. But, we actually see both sides of the fence. We study the coverage options available and try to bring you the best options for your farm. And, Because we are on your farm and in the country with seed and Precision business, and even on our way to work, we are often aware of loss situations as quickly as you are and sometimes quicker. The minimum requirements for crop insurance training, annually, in SD is 4 credit hours. But we make it a point to go beyond the minimum, attending trainings for all 3 of our providers 2 times per year and more and therefore can earn up to 24 credit hours per year. Each. That’s 6 times the required number. This helps us analyze how the information we learn will affect your policies. (and we are NOT texting or sleeping throughout those trainings). Those of you who have come to these annual market outlook sessions over the years know that we do not typically “advertise like this” We just try to provide good useful information. But we want you to be confident that your policies are in good hands and that you are getting the best Service, the best agents, and the knowledge to back it up to protect your business. 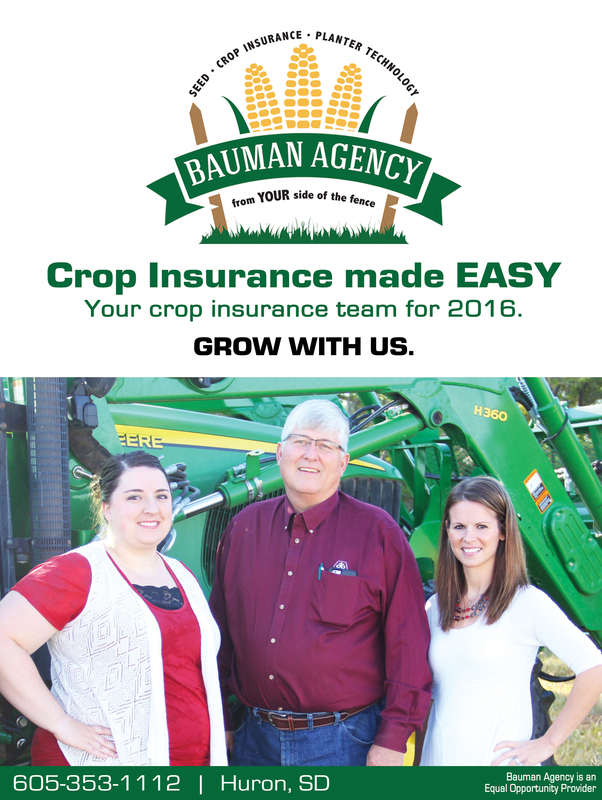 We want to make crop insurance easy for you. We really do see crop insurance from your side of the fence. We welcome the opportunity to serve you. Call Curt, Heather, Amanda, or Louise today to get a personalized quote.